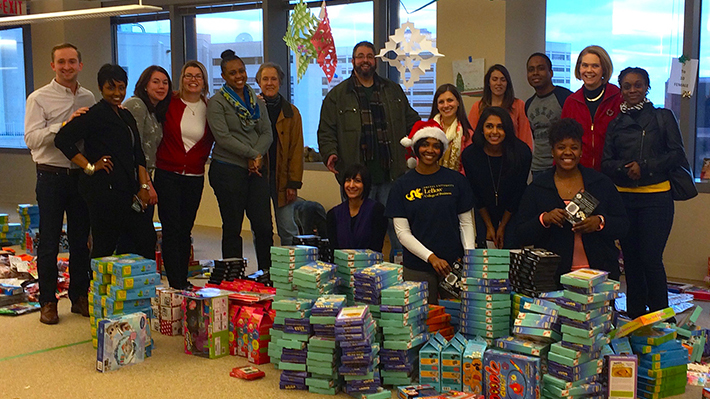 Volunteers from Drexel LeBow pitched in to help the Support Center for Child Advocates prepare and deliver thousands of donated toys to boys and girls in the Philadelphia region this holiday season. The help was desperately needed as the number of children who received gifts grew from 1,130 last year to 1,300 for the 2014 Holiday Toy Drive. Items were collected from local businesses, law firms and individuals and distributed as a way to brighten the holidays for boys and girls who are receiving services through the Support Center for Child Advocates. A team of LeBow staff from Undergraduate Programs spent a day sorting toys, assembling bikes and helping the children’s social workers fill out their wish lists with donated toys. The opportunity to help arose when Rita DiCarlo, assistant director of Undergraduate Career Services, reached out to Child Advocates to ask if they were in need of volunteers. The project was a perfect fit, as it not only allowed staff to give back, but also helped others celebrate the holiday season. In addition to their time, Undergraduate Programs donated $200 worth of toys and gift cards. The money was raised by linking the cause to casual Friday with a five dollar charge for wearing jeans to the office.